Since 2007, use of the Roman Missal of 1962 has been broadly permitted within the church. This creates, in effect, two liturgical years running concurrently. In Advent to Pentecost, Abbot Patrick Regan compares the prayers and prefaces, readings and rubrics, calendar and chants of the 1962 Missal with those of the Missal as it was revised following the Second Vatican Council, now in its third edition. The result is a striking demonstration of the splendor and superiority of the reformed Missal over its predecessor, at least as far as the liturgical year is concerned. Regan's chapters on Advent, Lent, and the Easter Season are particularly informative because these seasons are so different in the two missals. Perhaps less obvious are the differences between Holy Week and the Triduum. Regan not only describes external modifications in the services as restored by Pius XII in 1956 but explores deeper theological currents, especially in the relationship between the passion and resurrection of the Lord in the one paschal mystery, to show how advances in this area find expression in the current Triduum celebrations and throughout the fifty days of Easter. The originality of the book lies mainly here. The most urgent liturgical challenge today, the author contends, is to raise the ars celebrandi to the same level of excellence as the Missal itself. Patrick Regan, OSB, is professor of liturgy and sacramental theology at the Pontifical Athenaeum of Saint Anselm. He was abbot of his community, Saint Joseph Abbey in Louisiana, for almost twenty years. 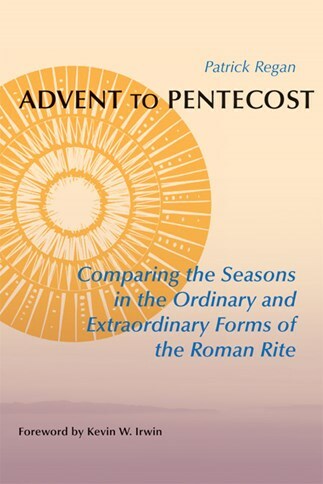 Patrick Regan's Advent to Pentecost is destined become a classic in the fields of liturgiology and pastoral theology. His analysis is both meticulous and pastoral. He provides the reader with a scholarly historical orientation that is far more spiritual than it is pedantic. Throughout he offers excellent pastoral suggestions so that pastors and preachers will want as a regular reference. For those of us who were shaped by the 1962 Missal, this analysis enables us to see how richer our lives and spirituality are following the reforms of the Second Vatican Council. For many it will clear away the cobwebs of nostalgia and the illusion that the 1962 Missal was inherently more reverent as Fr. Regan ably makes up for what was lacking in liturgical formation forty years ago. What a marvelous piece of scholarship! Abbot Regan has gifted us with a novel, insightful, and fresh approach to the festal seasons. Rich theological insight, practical pastoral critique, carefully researched textual development, invaluable ritual and scriptural analysis, and a pervasive liturgical spirituality mark this book. Its content is thoroughly grounded in the paschal mystery. Its methodology is, in effect, a contemporary mystagogy. This book would quicken anyone's heart to celebrate more eagerly the readings and chants, prayers and other texts of the Eucharistic liturgy during the festal seasons. Patrick Regan provides a valuable study that will be an essential tool for academic research, pastoral practice, and liturgical planning. He demonstrates the organic development of the Missale Romanum 1970 in continuity not only with Missale Romanum 1962 but also with all that preceded it, and in so doing he presents the close relationship between the `Ordinary' and the `Extraordinary' forms of the Roman Rite. Regan's research sheds new light on the purpose and meaning of the liturgical seasons and feasts of the Roman calendar. Abbot Patrick has produced a gem here. It is necessary and timely reading for anyone seeking to understand the current shape, contents, theology, and spirituality of the liturgical year. Highly recommended.